Teachers play important role in one's life and so with me specially my respected Madam Dr Sangeeta Sharma to whom I always remain indebted for her guidance, her vision and her dedication for the profession. 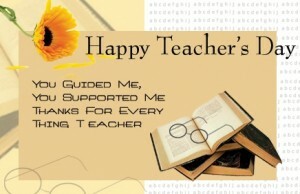 Thank You Madam and all other teachers who always teach me to be a good human being. Meaning: Guru can guide us to the supreme knowledge of THAT which pervades all the living and non-living beings in the entire Universe (namely Brahman). I salute such a Guru. Meaning: A Guru can save us from the pangs of ignorance (darkness) by applying to us the balm of knowledge or awareness of the Supreme, I salute such a Guru. Meaning: That Guru who can enlighten us about the all pervading consciousness present in all the three world or states (of Jaagrath, Swapna and Sushupti ... activity, dream and deep sleep state), I salute such a Guru. Meaning: That revered Master who directs my attention to the ONE divinity existing in all that is inert (immobile) as well as that which is active (mobile), I salute such a Guru. Meaning: That Guru who is the ocean of the Srutis (Vedas), the Sun of knowledge (who can destroy our ignorance with these rays), I salute such a Guru. Meaning: That Guru who is the representative of the unchangeable, ever present, peaceful spirit, who is one pointed and beyond the realm of space and time, whose vision is always enchanting, I salute such a Guru. Meaning: The one who is an ocean of knowledge, who is always in Yoga (in unison With God) who is adorned by the knowledge of the God principle, the One Who can liberate us from this mundane existence, I salute such a Guru. Meaning: The one who can help us free from the chain of karma accumulated over several lives, by teaching us the knowledge of the self (Atma Gnyaana), I salute such a Guru. Meaning: The one who can help us cross this ocean of life, the one who can reveal to us the Divine, I adore his Paadukaas (hold on to his feet), I salute such a Guru. Meaning: There no greater principle than the Guru; there is no greater penance than the Guru; There is no greater knowledge than meditation on such a Guru. I salute such a Guru. Meaning: The Lord of the world is my Lord and the Guru of the World is my Guru, the SELF in me is the same which is present in all (the same divinity inherent in all beings). I salute such a Guru (who gives me this insight). Meaning: The Guru has neither beginning nor end; the Guru is the ultimate God (in the visible form). There is nothing beyond this Guru principle, and I salute such a Guru. Meaning: This sloka tries to describe the qualities of a true Guru. A real Guru has the following qualities. He experiences the supreme Bliss of Brahmaananda (transcedental divine bliss). He enjoys and confers changeless supreme happiness. He is beyond space and time (there is nothing higher than him). He is the embodiment of wisdom which is the basis for all types of knowledge. He transcends the pair of opposites (such as happiness and sorrow, gain and loss). He is more Omnipresent than space itself. He is the very embodiment of the Divine principle, which is the inner meaning of the four great pronouncements Prajnaanam Brahma, Aham Brahmasmi, Thath Thvam Asi and Ayam Aathma Brahma. He is One without a second (ekam). He never changes under any circumstances (nithyam). He is without any type of impurity (vimalam). He is steady and motionless(achalam). He is the witness of everything. He transcends mental comprehension and verbal explanation. He is beyond the three gunas (sathva, rajas and thamas). I offer my humble salutations to such a Guru who possesses all these qualities. Meaning: I salute God Dakshina Moorthy (Shiva in Guru form) who is the Guru of all the worlds, the One who cures the disease of worldly existence and who is wealth of all knowledge. Meaning: I prostrate before Shanakara Bhagavatpada who is the house of all knowledge, the Shrutis, Smrutis and Puranas (all the Vedic texts). Meaning: Salutations unto Thee, O Vyasa of broad intellect and with eyes large like petals of full blown lotuses, by whom the lamp of knowledge filled with the oil of Mahabharata has been lighted. Meaning: I worship Lord Sainath, the destroyer of attachment, the Guru who preaches discrimination (sharpen the intellect). Meaning: I prostrate before the venerable Guru Raghavendra who is always professing Truth and Righteousness, the One who is like the kalpavriksha (wish fulfilling tree) and kamadhenu (celestial cow indicating prosperity) to the devotees (meaning He is a boon giver).